If swashbuckling pirates, exploring the most dangerous rivers of the world, or sampling one of Walt Disney Worlds most celebrated frozen treats is your thing, then get to Adventureland in the Magic Kingdom. Just take a left out of the central hub and cross the wooden bridge into a land Walt Disney himself created to transport guests far from civilization. Modeled after the original Adventureland in Disneyland, the Magic Kingdoms version surrounds visitors in part tropical paradise, part Caribbean fortress. Add an Arabian bazaar and plenty of Disney magic and humor and you’ve got Florida’s version. Inspired by the early 20th century Tiki craze and Disney’s popular Real Life Adventure films, this land is home to some of the Magic Kingdoms most popular and iconic attractions. As you walk about, you’re serenaded by 1930’s big band music. Be sure to pay attention to some of the more unusual announcements interspersed between songs. Stroll through lush greenery and enjoy an expedition on the Jungle Cruise; your wise-cracking guide will have you chuckling through the rivers of Asia and Africa. Climb to the top of the 60-foot high Swiss Family Treehouse for a birds-eye view of the land, or grab a delicious Dole Whip frozen treat and head to the Enchanted Tiki Room and enjoy Polynesian songs and music performed by exotic birds, tiki totems and statues. Of course, no passage through this land would be complete without a stop inside Castillo Del Morro to tempt fate aboard the Pirates of the Caribbean. Home to some of the parks most iconic scenes and characters, believe it or not, when Adventureland first opened in 1971, this attraction was absent. Imagineers assumed Floridians were so close to the Caribbean, a pirate attraction would be boring to guests. After a mini mutiny by visitors wanting the attraction, the Imagineers quickly added it to the Adventureland line-up. 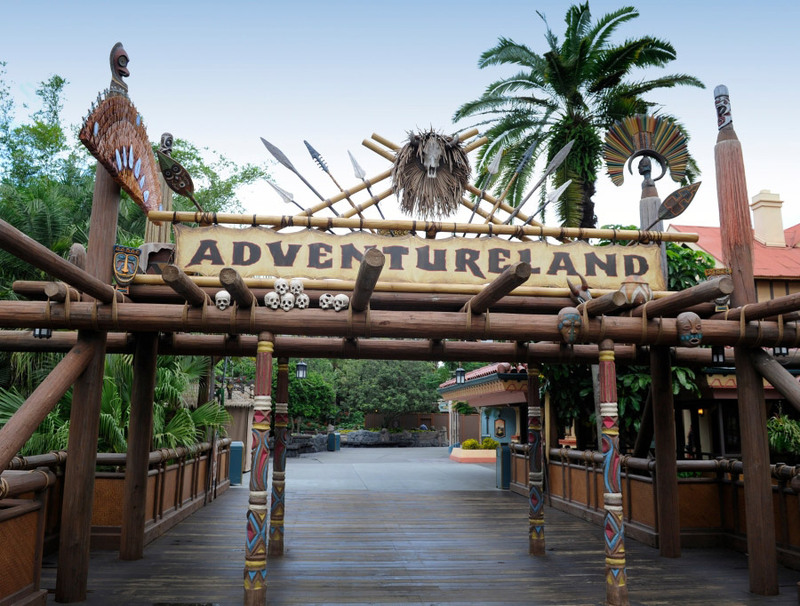 One of the most storied lands in the Magic Kingdom, Adventureland can take you all over the world without leaving the safety of central Florida, and is almost a rite of passage for every wannabe pirate, castaway, explorer or sultan.